It's A Dan's World: FOLLOW THE CREATOR: What Is Marc Silvestri's Secret Project? FOLLOW THE CREATOR: What Is Marc Silvestri's Secret Project? The internet can be a labyrinth. Those creators not avoiding internet trolls can be hard to find. One dude you seriously need to be paying attention to is Marc Silvestri. 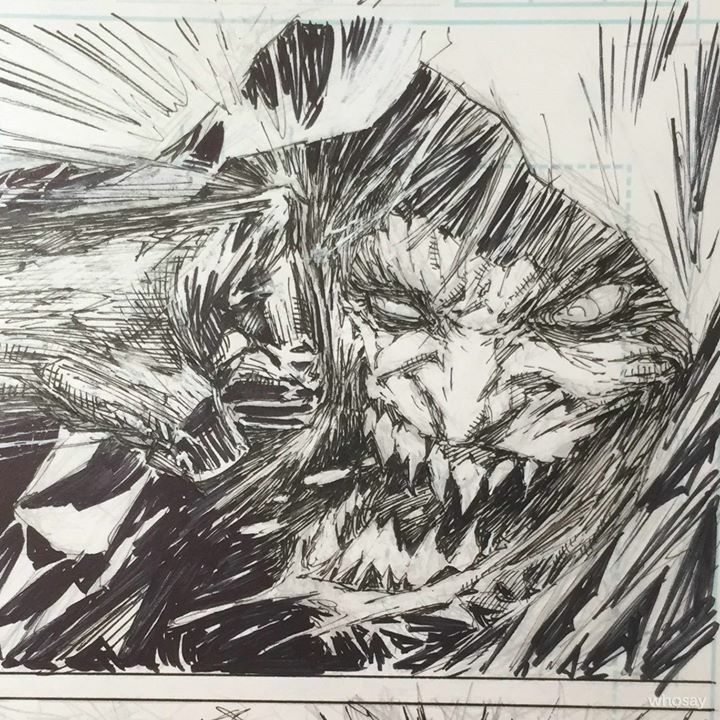 Over on his Facebook page, he is posting scenes from a secret project which could be his long awaited take on Batman. It could be an all-new Top Cow project, it could be... well just check out these teaser images and see what you think! Of all the original Image founders, Marc has been the one to most consistently and continuously evolve. Always one of the strongest artists in comics, his covers for the recent Cyberforce series show Ripclaw and co. have never looked better. Here, my money has to land on Batman. It's an obvious creator/character dream team, and while the villain above looks as Hobgoblin as it may be Killer Croc-ish, below, that glove, those playing cards, that architecture all seems to point Gotham's way. Could Marc already be working on the return of Bruce Wayne? Hopefully we'll find out soon. Ready to get liking? Follow Marc today on Facebook. It certainly looks that way Dan. Especially the images of the dead guy with gun in hand, and a gloved hand picking evidence out of the wall. Batman Returns Silveresti-style it seems. And you're dead on, unlike his peers and contemporaries, Silveresti's art really has changed evolved a lot from his early X-men days, and even his early Top Cow stuff. Thanks Dale - I had that iconic shot of Batman sitting in the batcave that Silvestri has done as my mobile phone wallpaper for AGES. If he can make Bats that addictive sitting down, there's no telling how awesome 22 pages of Silvestri Dark Knight will be.